In Greek mythology, during the Grecian attack upon Troy, a deceptive ploy was used to gain entrance into the city. The Greeks built a large hollowed-out horse. Inside they placed some of their finest warriors. Feigning retreat, the Greeks gave up their position outside of Troy, abandoned their large horse, and departed to their ships. Believing that the Greeks had given up, the city of Troy hauled the large statue past their walls and into the city, rejoicing over their victory.During the night, the select group of soldiers climbed down out of the large horse, and opened the gates. The soldiers who had left and returned to the boats had returned in the night and with the gates now open, took the city. 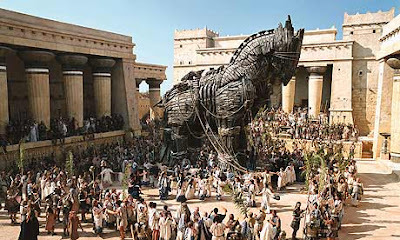 Nowadays, the Western nations seem to be just as naive and trusting as the people of Troy. 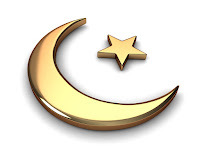 We seem to be willingly blind to Islam's equally dangerous and deceptive practice of Taqiyya. Unless we open our eyes, I believe Islam will conquer the Western nations with their form of the Trojan horse. Islam has the largerst birth rate among religions, With enough time and infusion into the Western nations, Islam is poised for takeover. Islam is not a peaceful religion. We are constantly hearing that it is, but most Westerners haven't read the Koran, and are blind and ignorant of the ultimate goals of Islam. The Doctrine of Taqiyya, originates from the Koran (Qur'an) , Surah 3:28. 6. Utter insincere oaths or lie. That means non-Muslims cannot trust anyone who practices Islam No matter how nice they are. No matter that they seem like wonderful people, and their children play with yours. No matter that you have worked or been educated side by side with them for years. When silly Westerners allow Muslim immigration into this country, they are hauling the Muslim Trojan Horse within their boundaries. Islam has proven over and over again that they are extremely patient when carrying out their plans. Patience is a proven weapon against those who are reactionary and impulsive. Our country is actively promoting the settling of largely Muslim groups of refugees into our country. Right here in Idaho, hundreds and ultimately thousands of Muslims are being purposefully infused into our midst. Funded by George Soros, "Welcoming America", and "Open Society"along with the White House Task Force on New Americans our Western society is being diluted by Muslims for the sake of financial gain. Here is an article dealing with the Idaho situation, which exhibits the blindness with which our politicians are selling our Western democracy down the river. desire to dilute our Western society with Eastern cultures, there will be little United States of America to recognize in the not-so-distant future.